Some time ago, a video made the rounds of in-boxes and television newsmagazines in which a driver pulled up close behind a vehicle being towed and woke his passenger up shouting, pretending they were staring into the headlights of an oncoming truck. While many found the prank funny, our Northern California car accident law firm couldn’t help but think of the real nightmare of head-on wrong-way crashes. Although relatively uncommon, wrong-way accidents are more likely to cause death or serious injury than an average collision. We help the victims of these terrible crashes, those who saw real headlights approaching and the families whose loved ones final moments may have been marked by that terrible image. 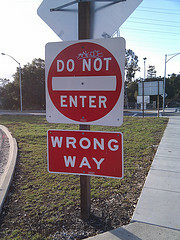 A wrong way-crash claimed three lives in Sacramento not long after midnight on Tuesday April 12. According to The Oakland Tribune, a 24 year-old Hayward man from and a 25 year-old South San Francisco man were killed when their vehicle was struck by a Ford F-150 pickup truck on I-80 near Madison Avenue. Police say the truck was going the wrong direction in the highway’s fast lane at the time of the crash. The driver of the pickup, identified only as a male as of the time of this writing, also died in the collision. In the May/June 2012 issue of Public Roads, a Federal Highway Administration publication, two highway safety experts focused on wrong-crashes. The study was limited to wrong-way crashes on Michigan freeways from 2005 to 2009 where the subject vehicle was known or believed to have entered the freeway by travelling the wrong direction on an exit ramp. Researchers studied 110 of these wrong-way freeway entry crashes. In 101 of the crashes for which impairment (or lack thereof) was recorded, 60% of the wrong-way drivers were under the influence of alcohol and/or drugs at the time of the crash. Looking at all 110 incidents, 57% occurred between 11 P.M. and 6 A.M. In contrast, only 16% of all Michigan freeway crashes in the 5-year period occurred in that timeframe. Even more markedly, 71% of the wrong-way crashes that resulted in death or incapacity occurred in that overnight period. The authors suggest this is not surprising since wrong-way entries generally involve driver confusion which is more likely to occur in the dark. Further statistics suggest confusion is amplified in younger impaired drivers and older drivers regardless of impairment. When gender was noted, males were implicated in 75 crashes and females in 33, numbers consistent with the overall gender distribution in serious crashes. Researchers also examined the location of wrong-way crashes and the type of road design involved. A greater share of the most serious crashes occurred on the freeway itself rather than the ramp, possibly due to vehicle speed. The authors suggested installing additional warning signals or other control devices along the full length of exit ramps rather than only near the intersection might help prevent these crashes. Echoing other studies, the researchers found interchanges that place an exit ramp immediately next to an entrance ramp (including the style of interchange known as a partial cloverleaf) are disproportionately likely to cause confusion and wrong-way entries. When the style of entryway was known, 60% of wrong-way crashes involved a partial cloverleaf interchange even though only 21% of Michigan interchanges use that format. Municipal authorities can take a number of steps, some relatively inexpensive, to prevent wrong-way crashes. Still, ultimately it is a matter of driver attentiveness. Wrong-way drivers put themselves, their passengers, and everyone on the roads at risk. As in other cases, negligent drivers should be held accountable for the results of their actions. If you were hurt or lost a family member because of a wrong-way driver in Northern California, call our wrong-way crash lawyer in San Francisco, Oakland, or Santa Rosa. We will fight to get you compensation, helping help you move forward and helping prevent future tragedy.